The East Village is filled with hidden gems and tasty hole-in-the-wall joints. After making the rounds of my usual favorite brunch spots, I stumbled upon Virage which is quickly becoming a top favorite of mine! Touting itself as a restaurant that offers a "French/Italian/Middle Eastern menu", I love that it represents just what the East Village is - a smorgasbord of things I like. But let me be clear - Virage is not fabulous and filled with glitterati, it's not the next up and coming posh spot, nor is the food all organic and locally sourced. But its me and I love it. Upon entering, you get a feel of a great neighborhood spot. I love the straw backed chairs, cozy bar area in the back, the black and white checked floors, and the eclectic decoration. Plus, its packed! Clearly a neighborhood favorite! 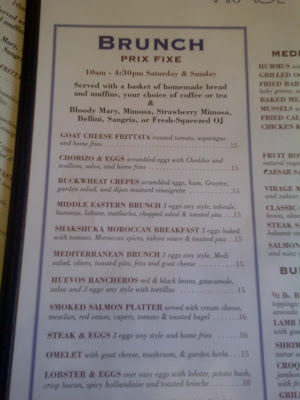 After perusing the menu, its obvious the brunch prix fixe is the best choice! For $15, you get basket of bread and muffins (I <3 my carbs! 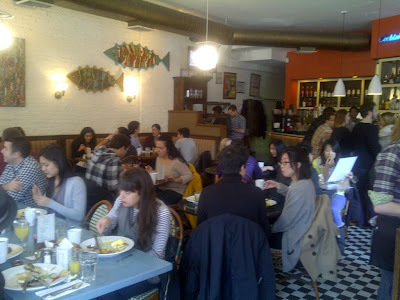 ), a brunch dish of your choice, coffee or tea, AND a drink! 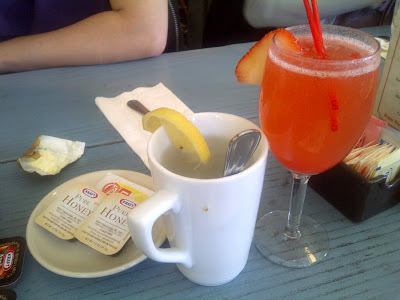 My tea and strawberry mimosa! After ordering, our waitress quickly brought out our bread and muffin basket and drinks. 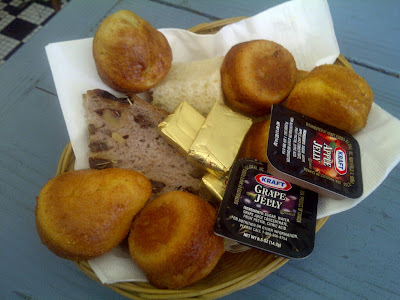 The bread and muffin basket wasn't gourmet, but definitely tasty and appreciated as I hungrily waited for my entree. And my strawberry mimosa? It was just the way I like it - big and with a straw! First of the entrees was the Lobster and Eggs. 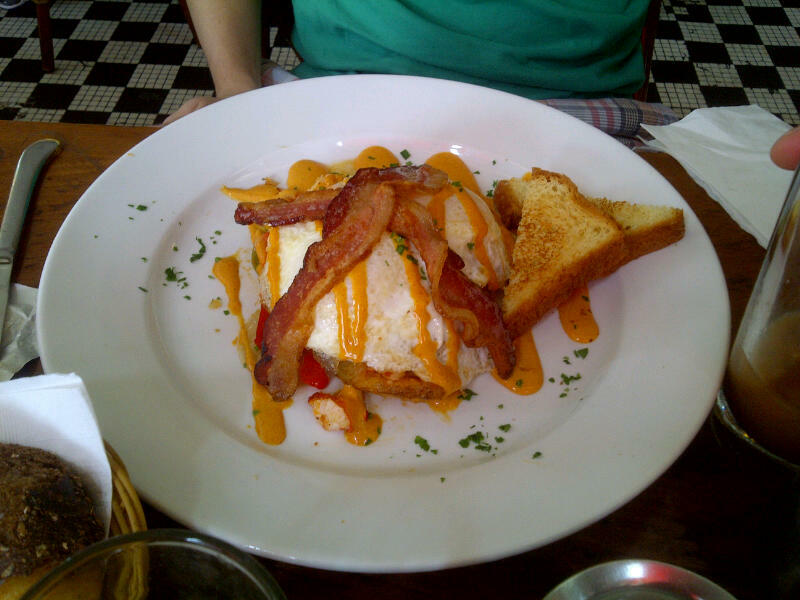 Crispy bacon, poached eggs, potato hash, spicy hollandaise, and brioche toast - whats not to love?! Chorizo and Eggs....with bacon instead! I ordered the Chorizo and Eggs, but substituted the chorizo for bacon and ordered my eggs in egg white. This dish was soooo good! 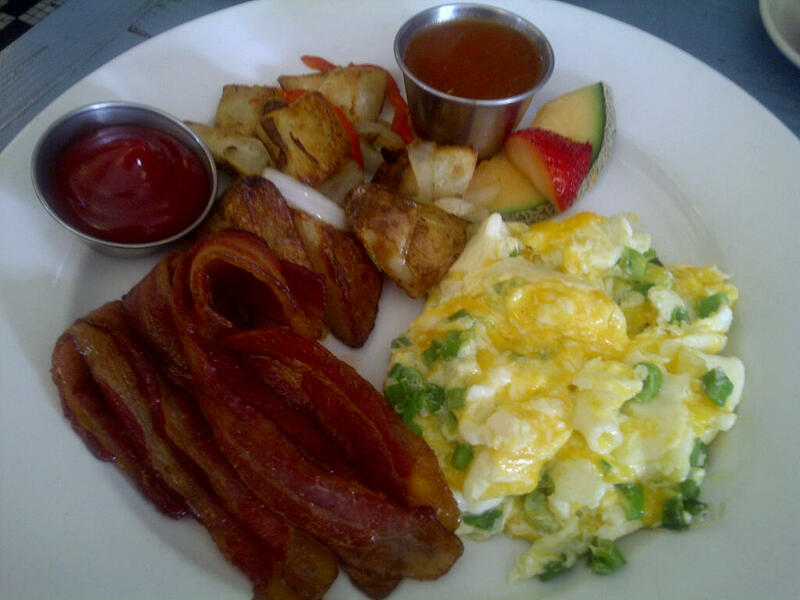 The eggs were scrambled with melty cheese and scallions and served with potatoes and crispy bacon. Ahhh so satisfying! 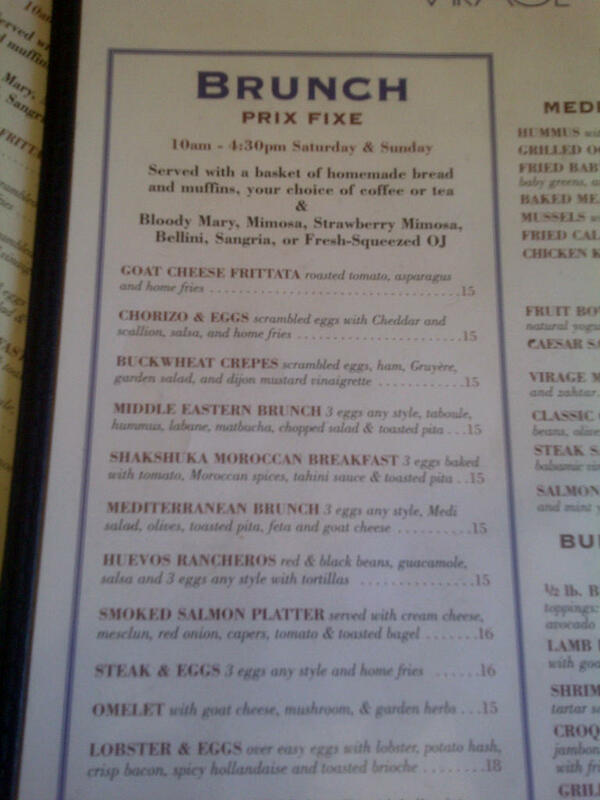 The winner and clear favorite of brunch, though, was the Shakshuka Moroccan Breakfast. Not sure if it’s because I haven’t been to many other French/Italian/Middle Eastern places for brunch, but I’ve never had a dish like this before! 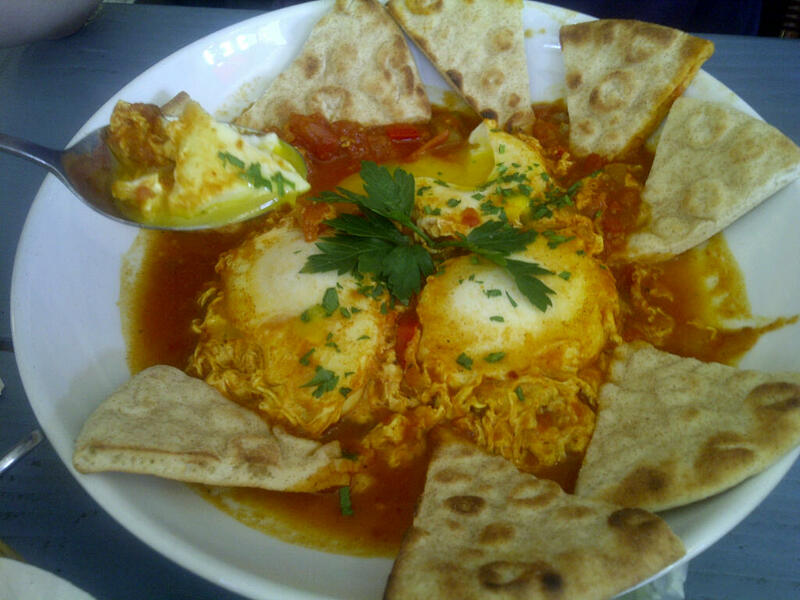 This dish is 3 eggs baked in a spiced tomato sauce and served with pita and tahini sauce on the side. Definitely worth coming and giving this off-the-beaten-path brunch dish a try! 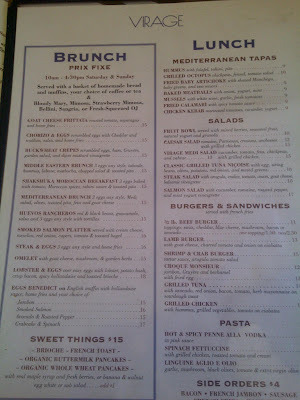 If you happen to stop by Virage for brunch, make sure to keep a look out for me! 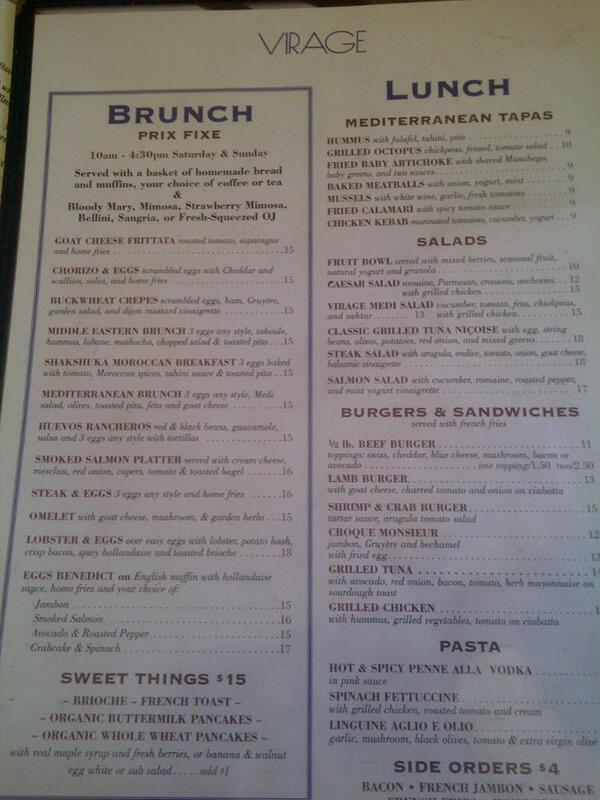 I’ll be at the regular’s table enjoying my Shakshula Moroccan Breakfast and strawberry mimosa.